Here it is, the latest iPad Pro. A refreshed version of Apple’s highest-end tablet is, as anticipated, the centerpiece for today’s big event in Brooklyn. The new tablet marks what is arguable the most radical departure for the line from a design perspective, since the line rolled out some eight and a half years ago. 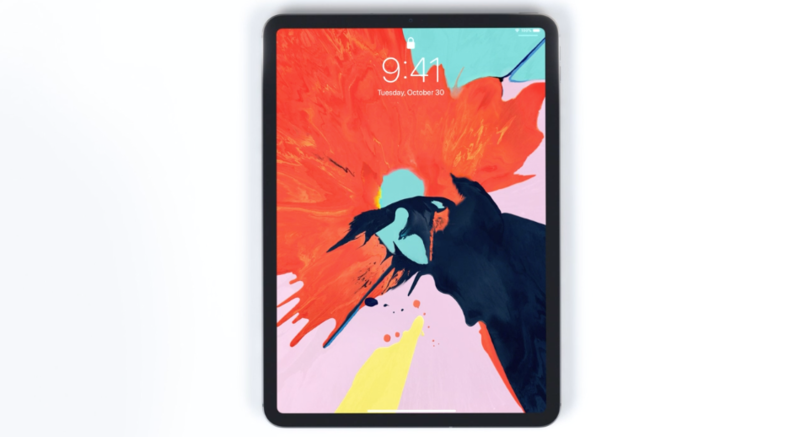 The “all new” iPad takes more than a few design cues from the iPhone line, continuing Apple’s single-minded focus of eliminating the world’s bezels. To achieve this, the company has dropped the home button, leaving only room for the front-facing camera along the top. Like the iPhone, the new Pro logs you in via FaceID using the depth-sensing, front-facing camera. There are four stereo speakers flanking the device, as well. Of course, a little bezel is require — after all, you’re going to need a place to put your hands. 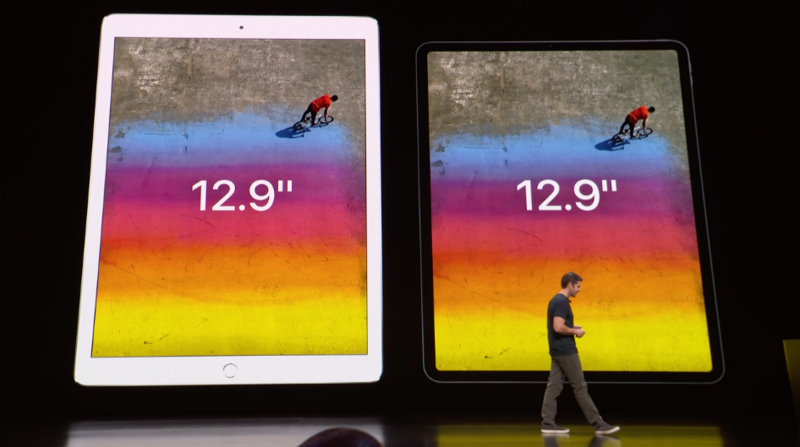 The new tablets are thinner than their predecessors (5.9 mm) and feature larger screen sizes at either 11 or 12.9 inches. The thinner design does mean the real camera pops out a bit from the rear. Inside, you’ll find the company’s latest chip, the A12X bionic, a step up from the iPhone’s 12. It features an 8 core CPU and a 7 core GPU. Performance is up 35 percent faster for single core and up to 90 percent faster for multi-core programs. Graphical performance is around double its predecessor. The new chip also brings the neural engine found on the company’s phones, which should help more intelligently perform tasks like editing photos. The company is working to position the device as a serious gaming platform — even going so far as comparing favorably it to the new Xbox, demoing a Warriors vs. Nets game on NBA 2k. The graphics were certainly solid for a tablet gaming demo. Ditto for the ability to run a full version of Photoshop on the device. Adobe is also one of the companies helping push Apple’s ARKit augmented reality platform. The company also demoed a sneak peak of a file created on its Project Aero AR app. Of course, controls are still very much a question when pitting a touchscreen slate against a devoted gaming platform. That said, the Pencil does interact pretty well with the Adobe demo, and the souped up, 8-core product handles images with several layers pretty admirably. Perhaps the biggest surprise of here is the addition of USB-C. That’s right, the company just ditched its longstanding Lightning port, in favor of the far more ubiquitous connector. And, get this, the iPad can actually be used as an external battery pack to key your iPhone alive. 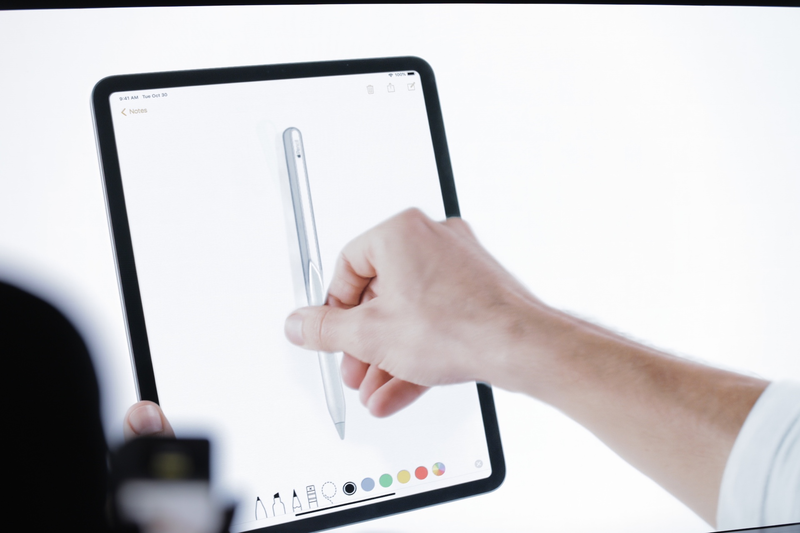 The Apple Pencil now snaps to the side of the tablet magnetically — and charges while it does so. The redesigned peripheral also features a few new tricks, like the ability to switch modes simply back tapping the side. There’s an upgraded version of the bluetooth folio keyboard case arriving for the redesigned device, as well. All in all, a pretty solid redesign for the top-level iPad, with a number of updates that will likely trickle down to the rest of the line in coming years. After all, the Pro has become something of a proving ground for the rest of the iPad line. Like the Mac Mini, the 11 inch iPad Pro starts at $799. The 12.9 inch version starts at $999. Both versions will come in LTE configurations. Pre-order starts today and the devices will begin shipping on November 7.